Many people want to limit the number of synthetic and potentially toxic chemicals that are absorbed into their body each day. The skin is the largest organ, on the body and absorbs everything you put on it, Therefore, whenever you can substitute just one product for something 100% natural, You will benefit significantly. Is this Deodorant for Men? Yes, this deodorant is unisex. Many of our male customers enjoy Sandalwood or Frankincense and Myrrh. Lavender is also a favorite. What does an antiperspirant do? Antiperspirants act by plugging the sweat ducts, thus reducing wetness. Because perspiration stimulates odor-causing bacteria, antiperspirants also help reduce body odor. Yes – it’s that simple. This deodorant has been tested and approved by several focus groups. Our deodorant puts an end to odor producing bacteria without harmful toxins or ingredients. The PH in baking soda is 7.0 most deodorant's ph is 6 and below. How long will the tube last? Each 2oz tube can last up to 5 months. One swipe under each arm will do. This deodorant is very concentrated. We use essential oils which are very concentrated. Does it sting/hurt? What happens if there is irritation? Wait at least 30 minutes after shaving before applying deodorant. Most new users of natural deodorants may need to give their body a short amount of time (at least a week or two) to adjust from using commercially produced deodorants. You should continue using the product, during this process you may experience some irritation as your body adjusts and releases the synthetic chemicals. After your body has adjusted to natural deodorants, you will find that it was WELL WORTH the change! Although some people can go a lifetime and never have irritation. A small percentage of people are unable to adjust to using baking soda based products right away. If you feel slight irritation or itching. 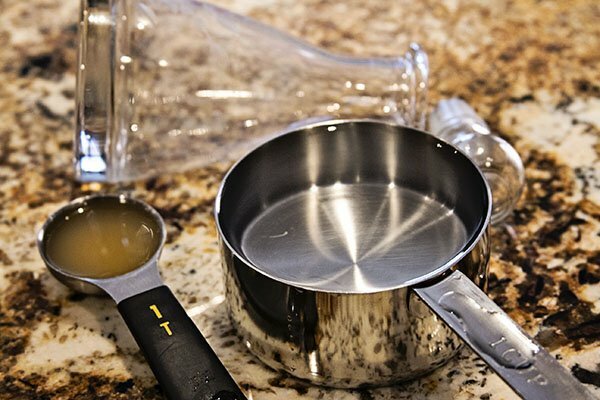 Mix together One tablespoon of Vinegar to 1 cup distilled (or well filtered) water in a small spray bottle. Before applying your deodorant, spray a small amount of this mixture, and rub it all over your armpit area.. Hold your arms up and let it dry completely. Then, once it’s dry, apply your deodorant. If your armpits are raw, you might want to take a total break from your baking-soda-based deodorant for about a week, and apply the vinegar two times a day. You may discover that this mixture is the only deodorant you need at this point. (When the itching and redness is completely gone, you are ready to try the natural deodorant again). From this point on, you can use the vinegar mixture before you apply your deodorant.. Yes, and you should! Sweating is good for you; it is your body’s way of releasing toxins. If you are blocking your sweat pores by using an antiperspirant, you impede your body’s ability to naturally release those toxins. Impeding this process may negatively affect the pH balance in your body, leaving your body more prone to infection by harmful viruses and bacteria.. The arrowroot used in our deodorant helps absorbs the sweat. Many athletes use our products with no regrets!! No… remember question number 3 – it works. The essential oils provide a natural clean scent. Even the unscented version has a natural clean smelling fragrance that is just divine! Our natural deodorant is safe to use. The ingredients that we use are edible! Unless you are allergic to any of the ingredients, you will not have a reaction to the deodorant. Most new users of natural deodorants may need to give their body a short adjustment period (at least a week or two) from using commercially produced deodorants. During this time, you may experience some irritation as your body adjusts and releases the synthetic chemicals it is accustomed to. However, a small percentage of people are unable to adjust to using baking soda based products. If an itchy irritation persists, rinse well with cool water, apply Aloe Vera Gel and discontinue use. Consult your physician if you are pregnant or nursing. Will it cause a stain in my clothes or leave an oily residue? This deodorant is not oily and should not cause a stain if you apply a small amount. However, if there is a residue, it can be easily removed by washing the garment with regular laundry detergent. What if I need extra protection? This deodorant should be used everyday as a part of your normal routine. For optimal results apply at night after showering. Applying while you sleep gives the body an opportunity to build up a stronger layer of protection for the next day. You should also apply a small amount the following morning after showering. NOTE: The information above is for educational information and any opinions expressed here-in do not replace professional medical advice. If you have concerns about the above information, please see a suitably qualified medical practitioner. Our Natural Deodorants Really WORK!! can be worn to the gym, out in the garden, to work, around the town or out on a date! "Its a great deodorant . Your arm pits will smell good. Its soothing to your arm when you put it on". "'The house of Velda Deodorant has been a prayer answered for me. I was looking for a natural deodorant that really works. I work out and tend to sweat much, nothing has worked until I was introduced to The House of Velda Deodorant. I love it!" "For me, the fragrance was a little too strong, but it works great. You are fragrant all day." "This deodorant has kept me smelling fresh all day even after my work out." "I hope this isn't too long! This was my first time using natural deodorant so I was a bit skeptical of how well it would be compared to the one that I was already using. I had the lavender natural deodorant and the first thing that I noticed is how natural the ingredients were. It smells like I can eat it. I am so used to applying a large amount of deodorant so it would last throughout the day. However, with the natural deodorant, it seems as if it melts into my skin and is totally invisible compared to other deodorants that just sits on top of the skin. This natural deodorant is so light that I don’t even notice it after I put it on. Most importantly, with just a little amount, I felt protected all day long using this natural deodorant. I can’t imagine all the other benefits I’m really getting with the natural oils that are included in this deodorant. Because it works so well on my skin, I give the product a two thumbs up."